Will Walsh boot a chance to boost housing in Hyde Park? 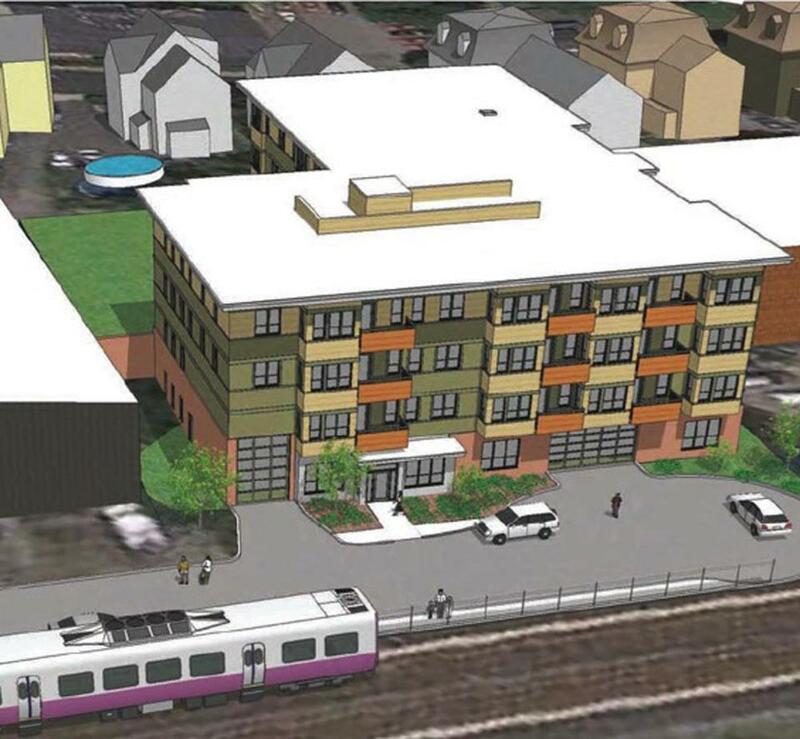 The 27-unit apartment building, seen in this artist’s rendering, would be right next to the Fairmount commuter rail station. The Walsh administration has made a lot of noise about the need for the creation of new housing that falls between the city’s luxury towers and low-income housing projects. Two nonprofit housing developers — Southwest Boston Community Development Corporation and Codman Square Neighborhood Development Corporation — have stepped up with a plan to build a $10 million apartment building targeted to working families earning about $45,000 per year. Mayor Walsh and his staff should be boosting this project. But City Hall has been eerily quiet. And Timothy McCarthy, the district councilor from Hyde Park, is cool to the idea, at best. People who make unconvincing arguments are usually good at listing lots of them. That was the case Tuesday night at a public hearing where several Hyde Park residents spoke out against the project. One woman described the architect’s rendering of the four-story apartment building as “really unattractive and very much out of character.” OK, it’s not the Winter Palace in St. Petersburg. But the drawing depicts a pleasant, modern building with clean lines. And “out of character” should be taken as a compliment. The new development would be built on the current site of a couple of rundown industrial properties. Another critic said he was “shocked and outraged” that the developers would build housing for families on a site near a polluted section of the Neponset River and within a few hundred yards of a former chemical plant. The developers said their environmental engineers have checked it out and don’t anticipate any unusual clean-up hurdles. And nothing gets built, they stressed, without safety permits from state environmental agencies. Still, the critics successfully raised the specter of a building full of asthmatic kids and wheezing pets. Neighborhood meetings are an intrinsic part of the development process in Boston for any project of more than 50,000 square feet. Too often, however, they become blocking mechanisms for NIMBY-minded residents who can argue floor area ratios and zoning variances with the city’s best land use attorneys. That’s fine when neighbors have legitimate gripes about the size and location of a development project. It’s not fine, however, when neighbors raise lame objections to desperately needed housing. One critic of the Hyde Park development predicted the arrival of a “bad sort” who might turn the affordable apartment house into a crummy public housing project. A few decades ago, that would have been code for keeping minority families out of the neighborhood. But the majority of people living in the Hyde Park neighborhood are people of color, and the speaker in this case was a black man. He might have had a point if the developers were proposing apartments solely for destitute people. But only three of the units would be set aside for the homeless or tenants with very low incomes. This is a middle-income development by design, with rents in the $1,300-$1,500 vicinity. Supporters of the project also came out in force. Some spoke of the development’s potential to spur improvements to the nearby business districts in Logan and Cleary squares. Others hoped it would attract more private housing development to the area. They were excited by the potential for change. But City Councilor McCarthy, who enjoys a close relationship with Mayor Walsh, didn’t share that view. “I think Hyde Park is pretty solid right now,” he said. Housing experts anticipate the need for 30,000 new residences in Boston by 2020. Underdeveloped areas along the Fairmount commuter rail line in Dorchester and Mattapan, as well as Hyde Park, are ideal sites for new apartments. Peevish protests are sure to arise in those neighborhoods, too. Walsh should set the standard by indicating his support for the Fairmount development when it seeks approval next month at the Boston Redevelopment Authority. Walsh certainly doesn’t need the political aggravation that might come from alienating a friendly district councilor along with residents in a high-voting area of the city. But his needs aren’t the issue. What the city needs is reasonably priced housing along its transit lines.